DAVAO CITY – Mayor Sara Duterte has called on all parents here to have their kids vaccinated not only against measles but also against other diseases for their protection. “It’s safe to have your children vaccinated,” Mayor Sara said in reference to the routine vaccination for infants including the anti-tuberculosis BCG (Bacillus Calmette–Guérin), anti-polio, MMR (measles, mumps, rubella), and anti-Hepa B, that are under the National Immunization Program given for free by the government. The mayor’s call came on the heels of the reported measles outbreak in Metro Manila and nearby regions. 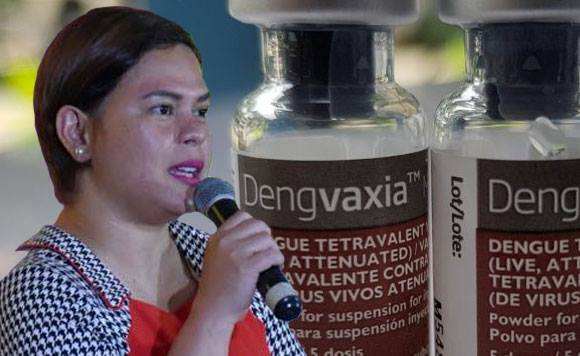 “We can’t really force parents to have their children vaccinated because of that stigma brought by Dengvaxia vaccination,” Mayor Sara said in a media interview. She recalled that the city government, through the City Health Office (CHO), intensified its immunization program following last year’s measles outbreak in the city. “Dapat lang gyud nato ipasabot sa mga ginikanan nga safe ang atong pagpabakuna especially kadtong ginahatag na gyud sa mga bata (We just need to explain and let the parents understand it is safe to have our children vaccinated especially those that have been given to them),” the mayor added. Last year, CHO rolled out its school-based, free immunization program in all public schools here for grade school kids to receive four vaccines — to avert deaths from measles, rubella (German measles), tetanus, and diphtheria (MRTD). From January to September last year, CHO recorded 602 suspected measles cases. Of the number, 45 were confirmed. The city also recorded 22 measles deaths during the same period in 2018. Following the measles outbreak in Metro Manila this week, the City Information Office (CIO) announced that the city government has renewed its vaccination campaign against the viral illness for the children’s protection. CIO reported that in January, this year, CHO recorded a decrease in measles cases with 45 cases compared to the same month last year when there were 141 cases. According to CHO chief Dr. Josephine Villafuerte, when one in the family has measles, everyone will get measles. She said all health centers are offering immunization for children even those out of target age. Vaccines are given free of charge. The Department of Health (DOH) already raised the red flag for measles in some regions of Luzon, Central and Eastern Visayas, aside from the National Capital Region. In its statement released last Tuesday, Feb. 5, DOH reported that as of January 26, 2019, there were 575 cases with 9 deaths in Calabarzon (Region 4A); NCR — 441 with five deaths; Region 3 — 192 cases with four deaths; Region 6 — 104 cases and three deaths; and Region 7 — 71 cases with one death. Also, Mimaropa (Region 4B) has 70 cases with no deaths; Region 1 — 64 cases with two deaths; Region 10 — 60 cases with no deaths; Region 8 — 54 cases and one death; and Region 12 — 43 cases with no deaths. These regions, according to DOH, should step-up their response against this highly communicable disease, ensure that preventive measures play a vital role in preventing the spread of the disease, and must be emphasized to mothers and the general public as a whole. DOH Secretary Dr. Francisco Duque III said measles is a highly contagious respiratory disease caused by a virus. It is transferred from person-to-person by sneezing, coughing, and close personal contact. Its signs and symptoms include cough, runny nose, red eyes/conjunctivitis, fever, and skin rashes lasting for more than three days. The disease’s complications included diarrhea, middle ear infection, pneumonia (infection of the lungs), encephalitis (swelling of the brain), malnutrition, and blindness which may lead to death.